The Institute of Contemporary Development held a roundtable on Temporary Labor Migration – Should Quotas Be Preserved? The event was organized by the Migration XXI Century Foundation with support from the Institute of Contemporary Development. Opening the discussion, INSOR Management Board Member Evgeny Gontmakher noted that the existing labor migration quota system in Russia is not working. “However, in society there is no consensus – are we really ready to accept immigrants into Russia?” he asked. President of the Migration XXI Century Foundation Vyacheslav Postavin made a presentation devoted to the history of migration in Russia as a way to understand the problems that have now arisen in the distribution of quotas. In his presentation Postavin noted the dynamics in the attraction of legal foreign labor from 1994 to 2011, gave examples of transformation of the quota mechanism and dynamics in the size and distribution of quotas and also pointed out the main reasons for the ineffectiveness of the quota mechanism. Postavin also mentioned suggestions for improving the quota system based on the experience of other countries. 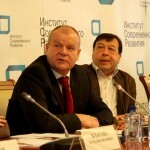 In part he noted the necessity of organizing together with the Russian Chamber of Trade and Industry surveys of employers on the state and trends in the development of the labor market to foresee the need for labor according to category of qualification and carrying out a simultaneous assessment of labor migration flows and remittances by migrants throughout the CIS. Irina Zbarskaya, head of the department of statistic in the social sphere and trade of the CIS Statistics Committee, completely agrees about the need for such measures. “Research is needed in order to resolve the problems,” she concluded, noting that there are no forecasts for the labor market. Grigory Tomchin, President of the All-Russia Association of Privatized and Private Enterprises, expressed his doubts that such research could pan out thanks to difficulties with extracting information private business. Deputy Director of the Department of Employment and Labor Migration of the Ministry of Healthcare and Social Development Georgy Gadenko said there is a need for a mechanism to regulate migration flows as well as uncover the real picture of the needs for labor resources. “The simplest path would be to cancel all quotas and permits, but it’s not clear what would come of this,” he concluded.